SiteGround has been in the web hosting industry for a long time. They started as a local web hosting provider in Sofia, Bulgaria. Now, they are popular all over the world. They offer some of the best web hosting packages. But, they are not only popular for their packages. Rather, they are well-known for their quality and stable service to their customers. One of their popular hosting services is the Reseller Web Hosting. Today, we are going to talk about that particular web hosting service. If you happen to be searching to know about SiteGround Reseller web hosting, then you should start reading this post. You will get to know various insider information about SiteGround from us. Then you can come to your decision whether it is good for you or not. This is not a new concept in the web hosting industry. There are many web hosting companies who offer ‘Reseller Web Hosting Service’. You might be wondering what this is. So we will try to explain it as simple as possible. It is a type of web hosting where the main account owner can use their allotted bandwidth and storage space to host any other persons’ (third party) websites. Let’s say you are a reseller. So, you will buy the web hosting services (any particular packages) from a popular web hosting company in bulk. Then you will resell those packages to your customers at your own chosen price. Here, the main seller will interact with you. And you will interact with your customers. SiteGround also offers Reseller Hosting Packages to their customers. They have some great features and services. So, first of all, let’s know about their plans. You already know that ‘Reseller Hosting’ has a different purpose than the other hosting packages. So, SiteGround has also taken a different approach to price this package. For this package, you don’t have the ability to choose a plan according to its price point. Rather, SiteGround has introduced ‘Credits’ to simplify things for the customers. Now, we will try to explain the ‘Credits’. First thing is that you will need at least 5 credits to get a Reseller hosting account with SiteGround. And, you can get up to 20 credits if you need to. Now, 1 credit will cover 1 year of hosting for 1 account. So, for instance, if you get 20 credits, you are getting 20 years’ worth of credit. Or, if you want to use 20 accounts at once then you will be able to run those 20 accounts for 1 year. Do you get the idea? As a matter of fact, the price of each credit varies depending on the number of credits you are going to buy. If you buy 5-10 credits then each of your credits will cost 45$. So, let’s say you are buying 10 credits for the first time, you will have to pay 450 $ (i.e. 10×45). 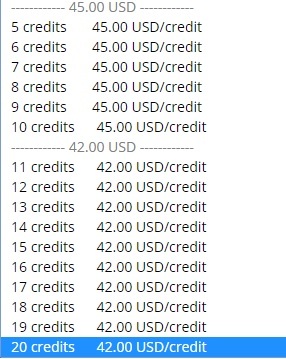 Again, if you buy 11-20 credits then the credits will cost only 42 $ each. So, if you buy 20 credits then you have to pay 840 $ (i.e. 20×42). You see that you get a discount if you order more credits at once. If you already have joined the reseller hosting program of SiteGround, then you can buy even 1 credit too. In that case, the price would be 49 $ per credit if you get 1-4 credits at once. The best thing about Siteground Reseller credits is that they never expire. So, you can use them anytime you want to renew or launch a new account. It is good to see that SiteGround is offering hosting accounts for such an affordable price range. Additionally, you will get free setup. SiteGround team will take care of the setup of your servers and such. You don’t have to worry about that. One thing to note, there is no difference in the hosting features and services. So, it doesn’t vary depending on the number of credits you are ordering. You will have the same facilities if you have as low as 1 or as high as 20 credits. We will talk about the features in the later part of this post. 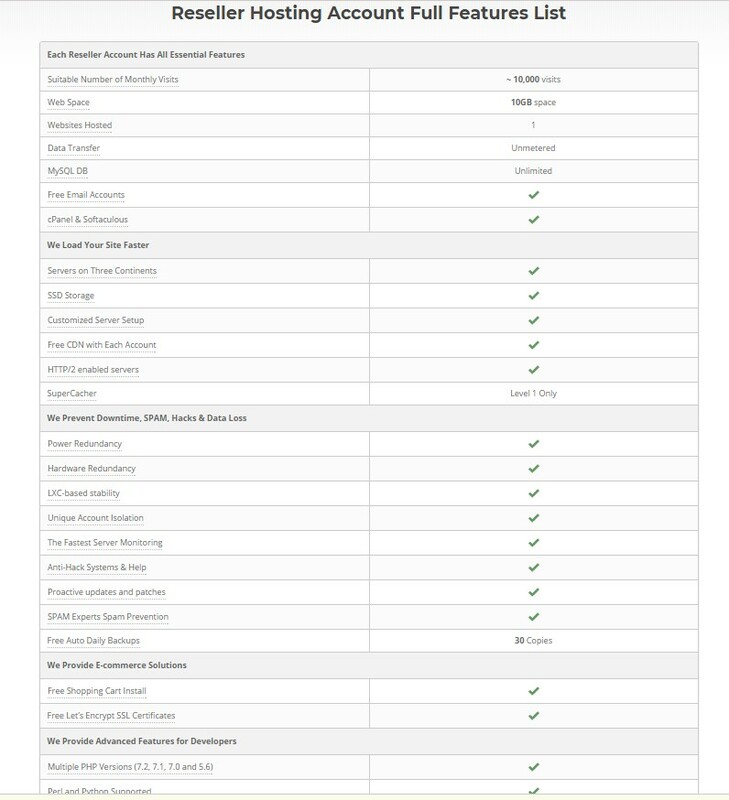 Who should choose the SiteGround Reseller Hosting Plan? Anybody can join the ‘Reseller Hosting Program’ of SiteGround. But, it depends on the requirements of the individual. Primarily, the ‘Reseller Hosting Packages’ are for web developers and web designers. If you are a web designer/developer who wants to offer a web hosting service as an add-on along with your services, then this is the best solution for you. On top of that, it is also good for startup web hosting companies. Let’s say you want to start a brand new web hosting company. But, it is complicated to set up everything needed for a web hosting company from the ground up. 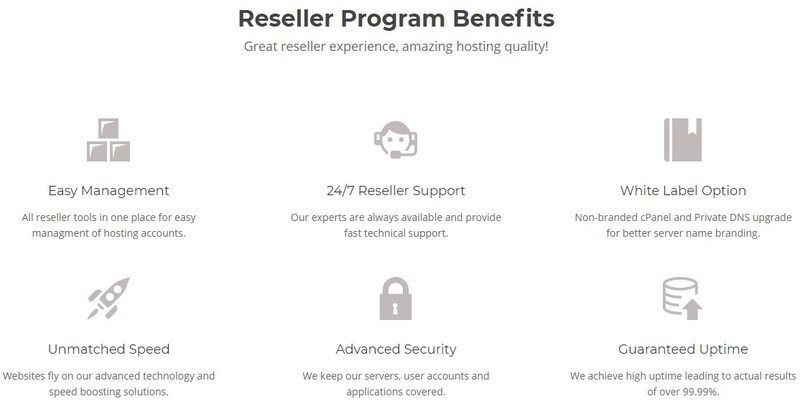 So, you can skip the hassle by getting a reseller hosting account. Using that account, you can sell the accounts to your customers at any given price of your choice. And, you can profit from reselling the hosting accounts. This is very common in the web hosting industry. Again, let’s say you are an entrepreneur, you have multiple websites. Now, if you want to cut down the cost of hosting multiple websites, you can use the SiteGround reseller hosting package. As you know, the reseller credits of SiteGround don’t expire, you can use the opportunity in your favor. Typically, if you get a hosting account (Shared, Dedicated, Enterprise, Cloud etc. ), it will have an expiration or renewal date. So, you must use the accounts even if you are not ready, or else they are expiring. But, in the case of reseller hosting, you can use the credits to create a website any moment you want. There’s no hurry in it. To add to the list, if you are a non-techy, then you can also use this package. Because, all of the server related operations, hardware, software, and all the technical issues will be taken care of by the SiteGround team. You will just have to interact with your customers. You will have your own ‘Control Panel’ from which you can easily interact with and control the needs of your customers. So, if you want to resell web hosting service or want to host a lot of websites at once and want to save money at the same time in the process, SiteGround Reseller Hosting account is a spectacular option for you. There are no restrictions on using any web applications with the SiteGround reseller account. There are a lot of CMS (Content Management System) out there. We know that some are very popular among them. And, normally everyone likes to use those popular ones to run their website. Fortunately, SiteGround has got it all covered. All of their servers are optimized for the popular CMS like Drupal, WordPress, Magento, and Joomla. So, you can use your favorite CMS to manage your websites without any problem. Along with all this, you will get some awesome features too. First off, you will have the ‘SuperCacher’ plugin of SiteGround. If you are not familiar with ‘SuperCacher’, it is a cache plugin specially developed by the SiteGround team to speed up all the websites hosted on SiteGround hosting. It comes in different levels, you will get the ‘Level 1 SuperCacher’ with the reseller package. Siteground Reseller hosting package comes with some incredible and unique services. You will come to know about some of the important ones in the following section. As a reseller hosting package user, you will get a lot of different hosting accounts. So, it will be very complicated to manage them. But, SiteGround knows that and they have come up with a great solution. They have made the reseller web hosting user interface very neat and clean and user-friendly. You will find all of the reseller tools in one place. So, you won’t have to go through the hassle at all. SiteGround is well-known for their performance. So, you will get high-quality service when you are using the reseller hosting packages. They have fast and stable servers to help your website load faster. And, SiteGround has some unique advanced speed boosting tools and technology which will come into making your website faster than ever. When you are using SiteGround reseller hosting service, you won’t have to worry about the security. All of the servers, user accounts, software, and applications are well secured by SiteGround. They have their in-house security software and firewall technology to prevent any kind of malicious cyber-attacks. So, you can enjoy using their web hosting service without a hitch. If you have a web hosting company where you are going to resell SiteGround’s package to your customers, then you will love this feature. Siteground will provide you with non-branded cPanel and private DNS for free. By using these, you will be able to customize everything the way you want. So, that you can promote your brand more easily. The uptime record of SiteGround is very high. They are known for achieving the industry-standard uptime record consistently. So, your website will not go down on a regular basis. We will talk about the uptime record of SiteGround later in this post in detail. You can contact SiteGround 24/7 all around the year. Whenever you face any problem, you can contact them and you will get a reply promptly. And, they will solve your problems as fast as possible. So, your customers can enjoy seamless services from your side. However, we will talk about their support system in detail later in this post. All of the necessary hardware and software will be already set up. And any connectivity issues will be taken care of by SiteGround. You won’t have to do anything. Instead, you can concentrate on your business while SiteGround takes care of the server sided issues. You should take backup of your websites regularly. For this, most of us use third-party backup apps. And, this cost us a lot. But, SiteGround offers backup service for free of cost with their reseller hosting package. SiteGround keeps a 30-day backup, so if anything goes wrong you can restore those backup when you need them. Siteground is very serious about the security of the websites hosted on their servers. They are constantly adding new rules to their WAF (Web Application Firewall) so that your sites stay secured. And, they always run security check-up behind the scene. If there’s a new vulnerability issue arise, they are prompt on fixing that too. All of the software on their servers are regularly updated in a timely manner. It helps to keep them out of reach of the hackers. So, if you want to have a secure web hosting experience then SiteGround reseller hosting is your best bet. SiteGround reseller package comes with numerous useful features. We will talk about some of the most useful ones below. Each of your website hosting account will have 10 GB of SSD storage. It is enough for a startup website. It can easily handle around 10,000 unique visitors per months. You will have unmetered data transfer on each of the reseller website account. So, you can grow your website without any limitations. Nowadays, SSL (Secure Sockets Layer) is very important for any websites. Normally you need to buy SSL certificates. But, fortunately, SiteGround offers SSL for free. Along with that, SiteGround offers integrating free CDN (Content Delivery Network) ‘Cloudflare’ with any of their packages. Even you can use any other paid CDN to maximize the speed and performance of your websites globally and locally. You will have free email accounts per domain name. So, you can create email accounts like ‘email@yourdaomin.com’. This makes your website look professional to your visitors. And, the best thing is that you can create unlimited email accounts. Another interesting feature is that you will have cPanel and Softaculous AutoInstaller with each account. So, you and your customers will be able to utilize these tools to simplify installing any CMS on the website/s. SiteGround has 4 data centers on 3 continents all around the world. You should know that the location of the server of your website has a very big impact on the performance of your website, you need to choose a web server which is closer to the maximum of your visitors. As SiteGround has 4 data centers, you have the option to choose the best location for you and your website visitors. Web hosting companies must have high-quality power sources on their data centers. Or else, the data centers might fail and all of your website/s will also go down. That’s why SiteGround has taken a lot of measures to prevent their data centers from going down. They have multiple power sources for all of their data centers. Additionally, they have generators and enterprise–class UPS as backup power sources in case if anything goes wrong. This is a very useful technology. Actually, SiteGround has introduced this technology in the world of web hosting at first. With this technology, SiteGround can isolate all of their customer’s hosting accounts from one another. It is even active on any shared hosting plans too. So, if one of the websites gets hacked, other websites from the same server won’t be affected by that. This is very helpful for the security of their customers. To prevent spams on their customers’ account, SiteGround has joined with ‘SpamExperts’. ‘SpamExperts’ is a very popular e-mail security service which works against spam. SiteGround has already integrated this great service with all their hosting accounts. So, you can keep your inbox out of the spammer’s reach. You can use the tool from within your cPanel without having any prior professional knowledge. It’s simple to use. Along with all of the mentioned features above, you will get more from SiteGround reseller hosting account. You can create unlimited FTP Accounts, MySQL and PostgreSQL Data Bases on each of your accounts. You will also get Free SSH and SFTP Access. It supports all of the major script languages like PHP, Python, and Perl etc. Not only that but also you will have 5 different versions of PHP. Plus, you can also install any of your favorite shopping cart (for online shops) for free. Overall, you are getting all the features ranging from the basic to advanced with this reseller hosting package from SiteGround. To show you the quality of SiteGround we need to actually conduct some tests on SiteGround. So, we are going to test the load speed of a website hosted on SiteGround. So that, you will be able to know whether they are good in performance or not. For the purpose of this test, we will be using ReviewPlan.com as the test subject. The reason behind this is that our website is actually hosted on SiteGround. We are now using the Chicago data center of SiteGround to host ReviewPlan.com. Now, let’s run the tests. First, we see that the performance grade is A. That is the highest possible grade. Next, we see that the load time of our site from the ‘San Jose’ server was just 829 ms. It indicates that our website has super-fast load speed. From the test, we can see that we have again got an ‘A’ on performance grade. And, surprisingly, our websites load time is less than the previous test. Here, the load time of ReviewPlan.com is just 685 ms. This indicates that our website is faster than 94% tested websites on Pingdom. All in all, we are so satisfied with these results. As you can already guess that it is only possible for the high-quality SiteGround servers. One of the most important things about any web hosting provider is their uptime record. You must know about their uptime record prior to choosing them as your web hosting provider. You should not take this lightly. Another thing, you should not believe the website hosting providers. They will always tell you that they have the best uptime record. So, you need to talk with a real user who is using their service. Then you will get the real answer. As a result, we will be sharing the uptime record of our website for you. So that you will be able to assess the performance of SiteGround from that. We keep monitoring our website’s uptime performance regularly. And, you already know that we are using SiteGround to host our website. So, you will find the uptime stat of ReviewPlan.com below. SiteGround actually has done awesome. 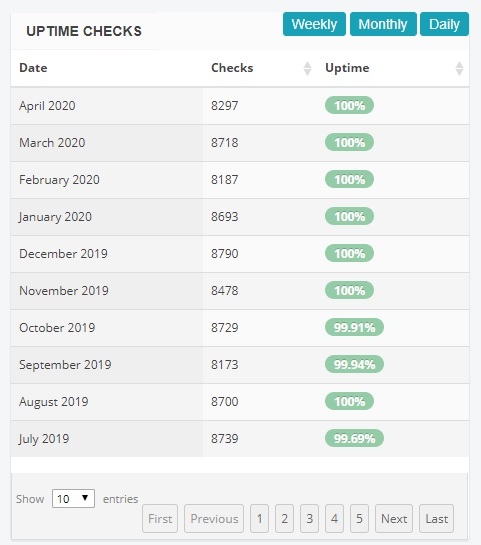 They have managed to keep the uptime 100% for almost all the months. However, on some months the uptime was not at full 100%. Although you can see that it was never less than 99%. As you know that the industry-standard uptime is 99%+, SiteGround could actually keep that comfortably. SiteGround has some of the best servers and some advanced tools to keep their performance that high consistently. With the help of Pro-active monitoring system, they can detect any server sided issues within 0.5 seconds. So, they can solve the issue as soon as possible. Along with that, this technology can also predict any issues even before occurring. So, SiteGround’s highly skilled developer team can start to figure out the issue in advance. When you are using the ‘Reseller Hosting Service’ of SiteGround, customer support becomes very crucial for you. Imagine that you have some customers who are using your (Reseller) web hosting service and suddenly the servers went off. Your customers will come to you for the solution like crazy. At that point, SiteGround is your savior. Thus, you need to contact them immediately. Luckily, SiteGround knows about their responsibility. And, they have one of the best customer support teams in the web hosting industry. For their reseller web hosting customers, they have VIP customer service. That means, if you are a reseller hosting customer, then your problems will be solved first. You will get the highest priority. You can get in touch with them using one of the 3 methods mentioned below. You can contact them anytime from anywhere you want. They are always available. All of their customer representatives are professional. So, your problem will be solved as quickly as possible. As one of their satisfied customers, we can say that they are at the top of customer support without a doubt. Our Final Thoughts: Should you use SiteGround Reseller Web Hosting? Until this point, we have tried our best to introduce and break down the concept of reseller web hosting to you. We expect that you have got all the necessary information to make your final decision. Clearly, if you want versatility and control over your web hosting account/s then this is a great option for you. SiteGround Reseller Web Hosting comes with every important features and service available which makes it a highly reliable web hosting service for you. So, we recommend SiteGround Reseller Web Hosting service to our readers without a second thought. We can guarantee that you will be very satisfied with your decision. SiteGround Reseller Web Hosting comes with every important features and service available which makes it a highly reliable web hosting service for you. Clearly, if you want versatility and control over your web hosting account/s then this is a great option for you.